In the 1950s, Small arms company Armalite (then bought as a division into the Fairchild Engine and Airplane Corporation) was founded to create firearms that focused on utilising the latest in material design to bring to market light, better weapons. The company, under the orders of legendary Chief Engineer Eugene Stoner brought to market two notable rifle designs to the table in it’s early life – The AR-10 and AR-15. The AR-10 competed initially for the Infantry Combat Rifle trials, which it ultimately lost to the M14, but the overall concepts and rough design layout it created printed the mold for it’s lighter calibre successor: the AR-15. Both systems have a direct gas impingement system – gas is tapped back via tube to the bolt to apply direct gas pressure on the bolt to cycle. The system as designed was simple to strip and operate, light and ,with the correct spec ammo, accurate and reliable. First adopters of the AR-15, the US Air Force and Army Special Forces, sung high praise of the rifle, ultimately leading to it’s introduction to service with the Marines as the M16. Unfortunately too late for Armalite itself, dissatisfied with the response in the market prior to wide adoption, sold the AR-10 and AR-15 patterns to Colt, and AR-10 to a Dutch company. Armalite had a few smaller successes with other Stoner designs (Notably the AR-18), but the company never really saw widespread success and closed it’s doors in 1988. Today, the AR-15 stands not as one weapon ,but as a family platform of largely interchangeable variations on the concept, with wide adoption in Military, Law Enforcement and Civilian shooting areas. This pack reflects just some of that variety, not to cover the bog standard M4s and M16s, but some more exotic variations. 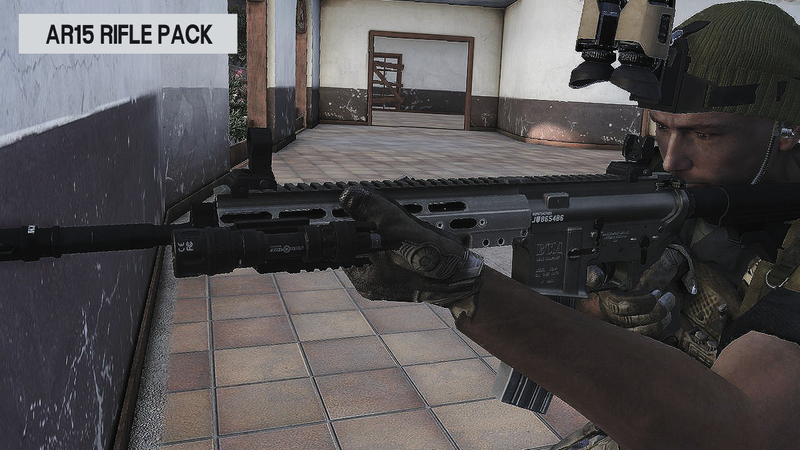 hlc_rifle_honeybadger Now has suppressor as default state.Can still accept attachment suppressors.